I adore bacon (who doesn't?) but I have less love for bacon desserts, most of which make me want to scream: You're not making dessert any better, you're only making bacon worse! 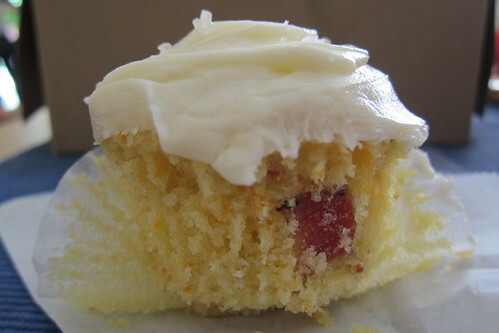 The bacon cornbread cupcake from Frosted Cupcakery is a rare exception. Already one of my favorite cupcake peddlers in L.A., their bacon cupcake succeeds where others have failed largely, I think, because of the batter. Not as grainy as cornbread and less sweet than traditional cake, it makes a terrific backdrop for the chunks of salty, thick-cut bacon lodged inside. Frosted with a light honey-buttercream and sprinkled with sea salt, it's like dipping your bacon into maple syrup without any of the sticky mess. 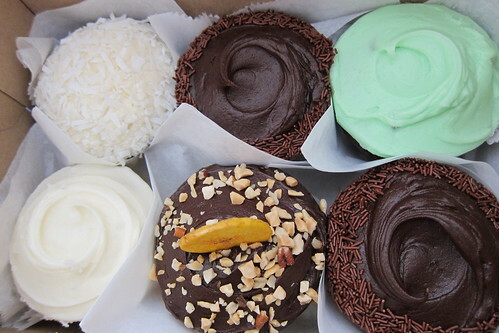 It's not one of Frosted Cupcakery's standard flavors. It is, quite literally, their Flavor of the Month, so you have only two more weeks to enjoy it. DISH: Bacon Cornbread Cupcake: $2.99.